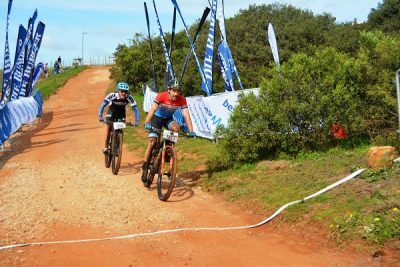 Marco Joubert was pleased to be back on the winner’s podium after a long struggle with injury as he successfully defended his title in the Bestmed-Makro mountain-bike race near Port Elizabeth today. Collarbone injuries kept Joubert sidelined for nearly three months earlier this year and he said today’s victory was a boost to his confidence. “It’s been a long struggle with the shoulder injury so it feels good to be back on form and taking the win,” he said. “After setting a high pace and getting away early on I didn’t want to get lost so I waited for Jason and Grant, who were second and third. “We rode together for a while until I managed to get away again. But then the same thing happened so I had to wait and Jason and I worked together from then. In the women’s race Anriette Schoeman, of Port Elizabeth, regained the title she won two years ago, also managing to break away from her challengers early on. This was the 41-year-old’s fourth mountain-bike title at the race in five years and came after she won last week’s road race for the 18th time. Although the weather was better than last week’s conditions when rain and wind battered the riders in the 106km road race, Schoeman said the mountain-bike event represented a tough challenge. “But there was a route glitch at one stage so I had to turn around and rejoin the group.